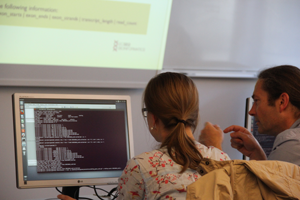 The 2015 workshop has been redesigned and adapted to the needs of beginners in the field of NGS bioinformatics. The workshops comprises four course modules which can be combined. This course module is optional. It will introduce the essential tools and file formats required for NGS data analysis. It helps to overcome the first hurdles when entering this (for NGS analyses) unavoidable operating system. Every participant who has no background in Linux usage should attend this course! This module is mandatory. Different methods of NGS will be explained, the most important notations be given and first analyses be performed. 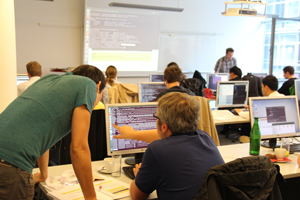 This course covers essential knowledge for analysing data of many different NGS applications. It also assures that all participants will be on the same level of knowledge for the downstream courses. Depending on the organism you are working with, our trainers will show you what's possible with your data and how you could/should interprete the output data. This module is not available anymore. *To attend this course, the "NGS Introduction" course has to be taken! Gero Doose (University of Leipzig) found and published several circularized RNAs in various RNA-Seq experiments. He specialized on split-read analysis some years ago and has a strong expertise in downstream analyses. 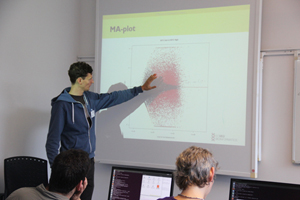 Christian Otto (University of Leipzig) is one of the developers of the split-read mapping tool segemehl and is an expert on implementing efficient algorithms for HTS data analyses. David Langenberger (ecSeq Bioinformatics) started working with small non-coding RNAs in 2006. Since 2009 he uses HTS technolgies to investigate these short regulatory RNAs as well as other targets. He has been part of several large HTS projects, for example the International Cancer Genome Consortium (ICGC). Mario Fasold (ecSeq Bioinformatics) works in the analysis of microarray data since 2007 and developed several bioinformatics tools such as the Bioconductor package AffyRNADegradation and the Larpack program package. Since 2011 he specialized in the field of HTS data analysis and helped analysing sequecing data of several large consortium projects.